Words I Write Crazy: We Have the Cover of Soulwood #4!!! 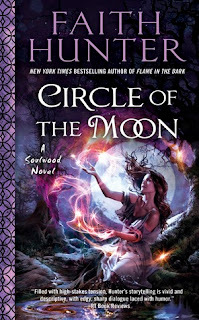 Yeah, we have the cover of Circle of the Moon by Faith Hunter! And I think it's the best and the prettiest covers of the series thus far! Set in the same world as Faith Hunter's New York Times bestselling Jane Yellowrock novels, the fourth Soulwood novel stars Nell Ingram, who channels her power from the earth. The purple looks really awesome, and those wisps/flares/sparks of power or something look so darned pretty! And this book sounds really awesome! I can't wait for February for this book! What about you guys? Happy reading!